Another signal that the stock market is over inflated and heading for a major correction is margin debt greater than 2.25% of GDP. Levels in April already show that this level has been hit. Previous stock market crashes have in common high margin debt greater than 2.25%. Will we be lucky this time around, unlikely. What do 1929, 2000 and 2007 all have in common? Those were all years in which we saw a dramatic spike in margin debt. In all three instances, investors became highly leveraged in order to “take advantage” of a soaring stock market. But of course we all know what happened each time. The spike in margin debt was rapidly followed by a horrifying stock market crash. Well guess what? It is happening again. In April (the last month we have a number for), margin debt rose to an all-time high of more than 384 billion dollars. The previous high was 381 billion dollars which occurred back in July 2007. Margin debt is about 29 percent higher than it was a year ago, and the S&P 500 has risen by more than 20 percent since last fall. The stock market just continues to rise even though the underlying economic fundamentals continue to get worse. So should we be alarmed? 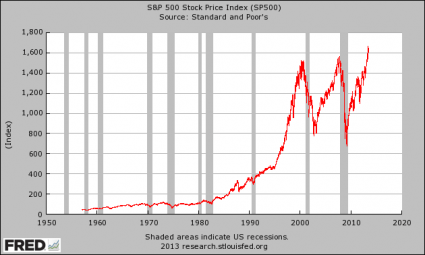 Is the stock market bubble going to burst at some point? Well, if history is any indication we are in big trouble. In the past, whenever margin debt has gone over 2.25% of GDP the stock market has crashed. That certainly does not mean that the market is going to crash this week, but it is a major red flag. The funny thing is that the fact that investors are so highly leveraged is being seen as a positive thing by many in the financial world. Some believe that a high level of margin debt is a sign that “investor confidence” is high and that the rally will continue.